Scott Cawthon, creator of the Five Nights at Freddy's series, has announced a new game - and it won't be a horror. In a Steam update yesterday, Five Nights at Freddy's creator Scott Cawthon stated that, while there will not be a Five Nights at Freddy's 5, he is working on a new title using the characters from the franchise - only it won't be a horror game. Rather, the new title, which will go by the name FNAF World, will be an RPG. "I wanted to use these characters in a new and fun way because they are so near and dear to my heart, and I was excited to work on a type of game that I hadn't made in a long time." Cawthon wrote. "The new game that I'm working on will be called FNAF World. It will not be a horror game, but a role playing game where you create a party using the huge selection of characters from the FNaF games, including the classic, withered, toy, phantom, and nightmare versions. I've been working steadily on characters and hope to start on enemy models next week." FNAF World is currently in development for PC, Android, and iOS. There is no release date at this time. Five Nights at Freddy's released in August of 2014, with sequels appearing in November 2014 and March 2015. 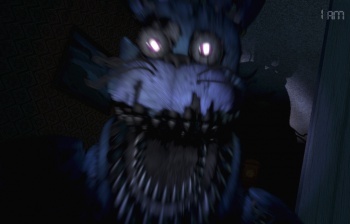 Five Nights at Freddy's 4 released on July 23, months earlier than its originally anticipated Halloween release date. In spite of the short periods of time between the games' releases, every title in the franchise has over 90% positive feedback ratings on Steam.